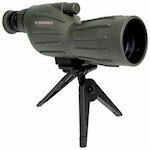 Konus KonuSpot spotting scopes are entry level scopes that perform very well for their price. They range in objective size from 50mm to 100mm, most with zoom eyepieces and table top tripods. KonuSpot spotting scopes range from the compact 18x50 mini-scope to the non-ED glass, full-sized spotting scopes perfect for beginners. Most KonuSpot scopes have zoom eyepieces, and objective lens sizes vary from 50 mm to 100 mm.